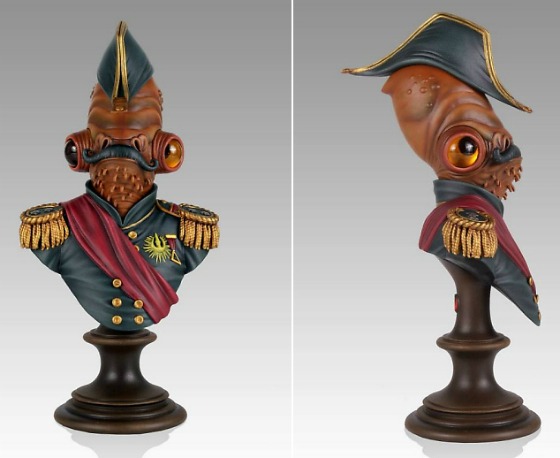 Following in the footsteps of South Park‘s Terrance & Philip, and Michael “Jefferson,” it’s…Admiral Ackbar dressed as Napoleon with a mustache! It’s derived from a painting by artist Steven Daily, but it also may take the cake as the strangest “Elseworlds”-like take on a character to be specifically endorsed as official merchandise. I guess Napoleon was so short that he might have been called a shrimp in his day. And Ackbar does have forearms similar to that classic sailor man, Popeye. Indeed, his eyes pop out more than anybody’s this side of Mantenna. This naval-gazing take on Return of the Jedi‘s favorite raspy trap-recognizer comes in a wooden box, and is avilable for preorder now from Gentle Giant at $175. At that range, it won’t last long against those scalper cruisers.